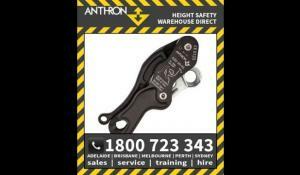 Order the Anthron Double Stop Descender DSD PLUS. Unbeatable prices on PPE and Height Safety products. The adoption of new versions of the norms of our well established and tested descenders have led us to develop a new improved version of the DSD descender. The strength and ergonomics were improved while retaining the same geometry and functionality. The DSDplus boasts an increased maximum working load, higher breaking forces, improved handling capabilities and a reduced force necessary to manipulate the device. The longer rubber coated handle, curvy side plates allow for a comfortable and reliable grip. 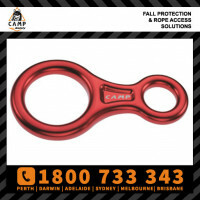 The possibility of incorrect insertion of the rope is small and it will not result in a fall. A wear indicator was integrated into the pivoting pulley. 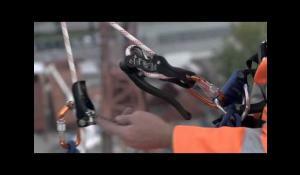 All these features make the DSDplus fit for single and assisted descents, intervention techniques, evacuations, rescue, plain rope access as well as sport use. Extremely robust construction allows breaking loads in excess of 25 kN. Increased maximum rated load to 200 kg. Reduced slippage of the rope to more than 800 daN. Reduced force required on the handle. (enhanced press stop braking mode). Tested for higher loads – enhanced braking in both stop positions. Diminished possibility of incorrect insertion of the rope. Even incorrect insertions will not result in a fall as the rope is blocked. High strength plain bearing added to the pivoting cam.